In addition to our vineyards, we also have orchards on our land. Both fruit and nut orchards. The fall is orchard season, especially with nuts. 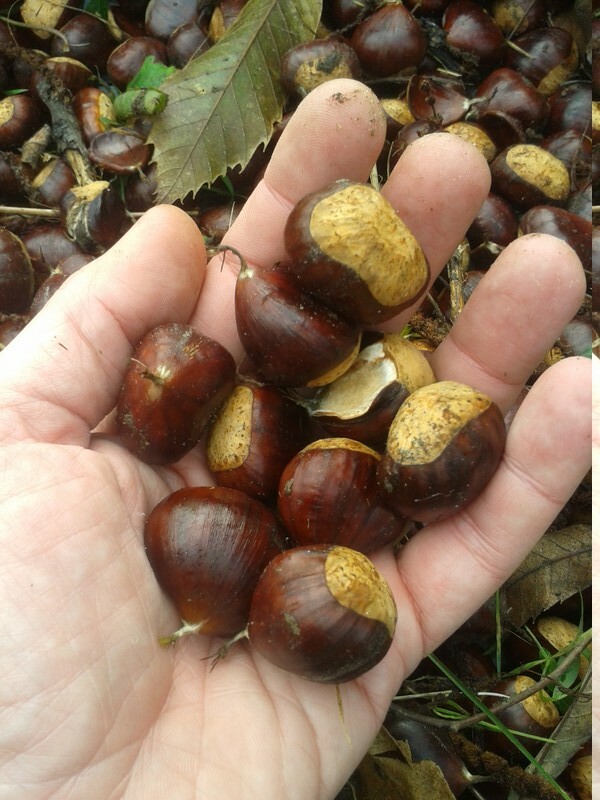 Today I am highlighting our chestnuts. Chestnuts are a tasty winter snack. Best roasted which also helps in peeling the hull. Chestnuts have a high water content, so before roasting cut a cross “X'” pattern in each nut’s shell to prevent the nut exploding and to aid in peeling, then place into an oven which is pre-heated to 200°C (400°F). Roasting in an oven at this temperature for 15 minutes should be enough. Or just keep an eye on the nuts in the oven and when the “X” starts to peel away, they are probably done. Peel and enjoy. Chestnuts are a low fat and protein, and high in carbohydrate nut. Chestnuts do not providing as much B vitamins as other nuts, but are the highest nut in Vitamin C content. Chestnut cupules are found on the ground under chestnut trees in the fall, and are very prickly. Best handled with gloves. Chestnuts out of their cupules.